This year my team had some big projects that we spent the better part of the year working on. It’s been a good year, and we’re ending it on a great note, launching two projects of incredible value to our members in the last week. On December 6th we released our iPhone App. Earlier this year we launched Mobile Web so members can use any kind of smartphone to do their banking in a way that is optimized for a small screen size, touch screen and browser. It was very important to us to launch Mobile Web first so all members have access to Mobile Banking. Then we could spend our calories on a really great app for our members with iPhones. Why iPhones? When we look at the metrics of site visitors to Vancity.com we see that of the traffic on our site coming from users on smartphones, the vast majority is from iOS. Over time we anticipate adding other apps for other devices, but with our member base iPhones took a clear lead. I’ve written before of our partnership with Central1, the credit union central for all CUs in BC and Ontario. They created this app with major input from two credit unions: Vancity and Mt. Lehman. We focused heavily on the user experience, which I believe will pay off with members. In only a few days we already have 49 reviews of the app in the App Store, almost all of which are a full five stars. It’s a very rewarding experience. And today we launched Interac e-Transfers. This is a standard feature in Canada which allows any Canadian to transfer money to any other Canadian via email or text message. All the big banks have long had this feature, but we had lagged behind. So it feels good to play catch up in this way and launch e-Transfers for our members. It is a much needed service, and now it’s available in Online Banking, Mobile Web and our iPhone App. Launching these great new services wouldn’t be possible without great partnerships. I have amazing staff in my department who bring these projects to life, we have outstanding relationships with our colleagues in our IT division and our partners at Central1. It’s a fantastic way to end the year, launching exciting new features, responding to the needs of our members who have been asking for these services for some time now, especially e-Transfers, and starting 2012 with the capacity to take on a bunch of new exciting projects. So have a happy New Year, and here’s to a great 2012! BC credit unions launch mobile banking commercials. 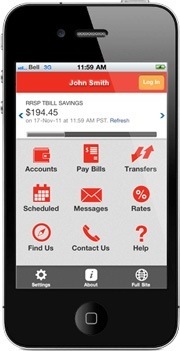 A few weeks ago, I blogged about Mobile Banking launching at Vancity. At the time we had just introduced it, as did many other BC credit unions. In fact, 80% of credit union members in BC now have access to this new feature. I also mentioned that all BC credit unions came together to advertise mobile banking province wide. Credit unions in BC have been working co-operatively for quite a while now (Gene, do you know how long the Province-Wide Advertising Committee has been around?) to advertise our shared differentiators. You can see a bunch of recent BC credit union ads on YouTube. Each addresses a different perception in the marketplace that we’re collectively trying to address in the minds of consumers. We know we have the emotional, or heart, attributes like giving back to the community, being local, etc… What we need to move the needle on is the intellectual, or head, attributes. These commercials deal with issues like accessibility (Ding Free ATMs), full service options (That Guy, one of the less successful ads in my opinion). And now with the mobile banking ads, we’re dealing with innovation. I’ve embedded the two mobile banking ads below, so take a look, and let me know what you think. I don’t sit on this committee so be honest. Personally, I like these commercials, and I also like many of the recent commercials credit unions in BC have run (That Guy excepted). PS: For those of you who wonder, that is NOT Gene Blishen as the dad in the second ad! I feel the same way. 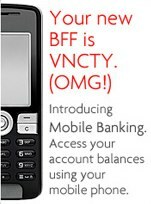 So I’m excited to say that Vancity has launched Mobile Banking to our Online Banking members. It’s pretty simple SMS banking where you register your cell number within Online Banking and then when you text to the shortcode VNCTY you get your balance or last five transactions. So it could come in handy if you need to know your balance in a hurry and you’re not near a computer. But the powerful thing here is getting members’ cell numbers into Online Banking, because that paves the way for text alerts which are of a much greater value. It also starts down the path of a more full-functioning Mobile Banking offer where our members can use an ATM/Branch locator, pay bills and transfer funds via their smart phone. That’s starting to get more interesting. So I’m excited and proud of this baby step and need to acknowledge the unsung hero of this initiative, one of my favourite strategic partners, Kelly West, the Director of Product Management at Central1. He wrote an awesome Mobile Banking strategy for all credit unions in BC and Ontario. Thanks to him, we’re headed down the right path. Thanks Kelly! One of the things I love about my work is that I get to collaborate with other credit unions in the province. At the end of 2008 80% of BC credit union members will have access to Mobile Banking. We worked on it together, we’re launching the same product to our members and next up, we’ll advertise Mobile Banking as a credit union innovative difference to BC residents. I’ll post more about that ad campaign when it launches in the New Year.